Macs hold their value very well, and it often makes sense to sell yours to help pay for the new model you are lusting after. Or you may be feeling generous, and you want to hand it down to someone needy. One question comes to mind; how do you secure your personal information? You do not want the new owner to have access to your banking information, browser history and chat logs, now do you? You really do not want to just hand it over as is. This MacTip will guide you through the disk erasing and fresh OS install process, so your can rest assured your data is safe no matter where your old Mac ends up. Following these steps will reset the computer to the “factory” unboxing state for the new owner to setup and enjoy. Update: Originally published in March 2011, this guide was updated several times to stay current in light of removal of optical disk drives and updates to Internet Recovery. Last updated March 2017. When you empty your trash bin on your Mac, the files are not really erased. Instead, the reference to the file is removed from the file system (which keeps a list of all the files on your computer), so the computer is able to write new information in the same physical area when space is needed. This is much quicker than rewriting that disk space with blank data, and it also gives you a chance to recover accidentally deleted files with handy recovery software. We recommend erasing the drive with Apple’s Disk Utility keep your personal data safe. Time. Budget at least an hour for this process, slower Internet connections and older hardware will take longer. Steps may vary with different version of macOS, and hardware configurations but the general idea is the same. We are erasing a 2014 MacBook Air running MacOS 10.12 Sierra, but the steps will be similar with any recent Mac. We are assuming you already copied all your data to an external backup, or to your new Mac, because the following steps will really erase your disk. The computer will begin to boot into the MacOS Recovery mode. The macOS Utilities menu will appear after a few minutes. Open Disk Utility to begin the disk erasing process. Select the Internal storage disk in the left-hand menu. It will be called Apple SSD on recent Macs. Click on the Erase button at the top of the Disk Utility, this brings up our disk formatting options. MacintoshHD is the default disk name in macOS, disk format required is Mac OS Extended (Journaled), and the Scheme is GUID Partition Map. After erasing the disk you are ready to move on to the operating system installation. An Internet connection is required to download a copy of macOS from Apple. Connect to a Wi-Fi network by clicking on the Wi-Fi icon at the top right of the menu bar. Now that you are connected to the Internet, click Reinstall macOS in the macOS Utilities menu. Follow the install prompts in the installation guide, read and agree the terms and conditions. When prompted to select an install disk, select the disk that we had just erased. There will only be one option in most cases. The computer will download a copy of macOS from Apple, and install it on the disk. The system download is several Gigabytes in size, therefore the length of time is determined by the speed of your internet connection. 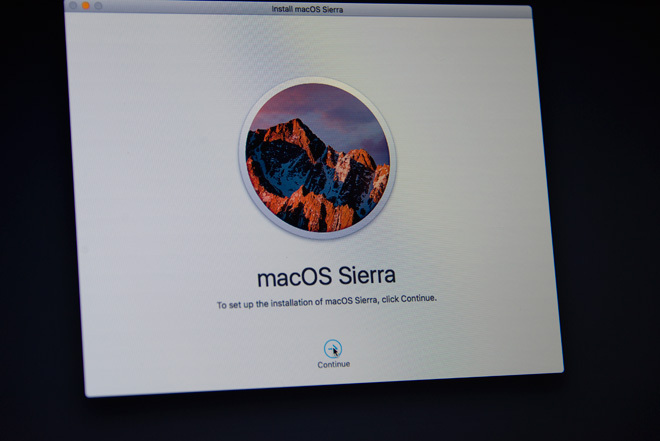 Once the installation is complete, the Mac will restart and display the factory fresh Welcome screen. At this point your Mac is ready to be handed over to a new owner. Unless the new owner is right there already with you, you will probably want to power down the Mac. Press the power button and a dialog box will appear that allows you to shut down. Give your beloved Mac a good physical wipe down with some dry cloths, and wave it goodbye.